Faced with increasing speculation over the fate of Kingfisher Airlines, its promoter Vijay Mallya went into damage control mode to allay fears that the airlines is shutting down and also denied that Kingfisher was seeking a bailout from the government. However, he said the airline was bleeding because of high fuel costs and interest burden and emphasised that other airlines were in the same boat. Comptroller & Auditor General Vinod Rai today appeared before the Joint Parliamentary Committee on the 2G Spectrum allocation and denied having overruled his DG (P&T) on audit figures. The CAG, however, explained that a higher authority taking a decision independent of the findings by juniors was a common practice in the CAG office. In a decision of far reaching consequences, Uttar Pradesh Chief Minister Mayawati today announced the tabling of a resolution in the forthcoming winter session of the state Assembly (scheduled from November 21) to carve out four smaller states. A Cabinet meeting chaired by her earlier in the day passed the proposal to introduce the resolution in the Assembly session. It�s bad news for frequent fliers from Indira Gandhi International Airport (IGIA) in New Delhi with flying costs all set to rise from December. Passengers flying out of IGIA airport will have to pay an additional Rs 200 when they take a domestic flight and an extra Rs 1,300 while boarding an international flight as Airport Development Fee (ADF). The Supreme Court today directed the government to provide details of all mercy petitions filed by death row convicts in order to lay down guidelines to be followed by officials while processing such pleas before forwarding these to the President or the state Governors. Unlike in other BJP-ruled states, Punjab has proved to be a disappointment for senior party leader LK Advani. He not only had to face black flags and eggs, even the BJP alliance partner Shiromani Akali Dal (SAD) remained distant. 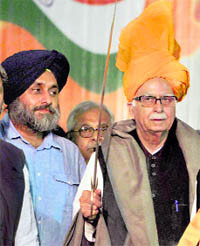 LK Advani with Punjab deputy CM Sukhbir Badal in Pathankot on Tuesday.